SALISBURY — Sitting in Starbucks about a year ago, a group of North Rowan and Salisbury High graduates were comparing college experiences and talking about their next steps after graduation. It was good to be home, and their mood was optimistic — but tinged with sadness and concern about the violence and negativity that seemed pervasive in Rowan County. Each of them had found their path from high school to college and were looking forward to pursuing careers and interests as young adults. Unfortunately, this was not the case for many of their peers. They had too many friends who were headed down the wrong road, and many who didn’t know how to overcome temporary challenges to reach their full potential. The group of friends decided to do something about the situation and to help the youth of Rowan County. 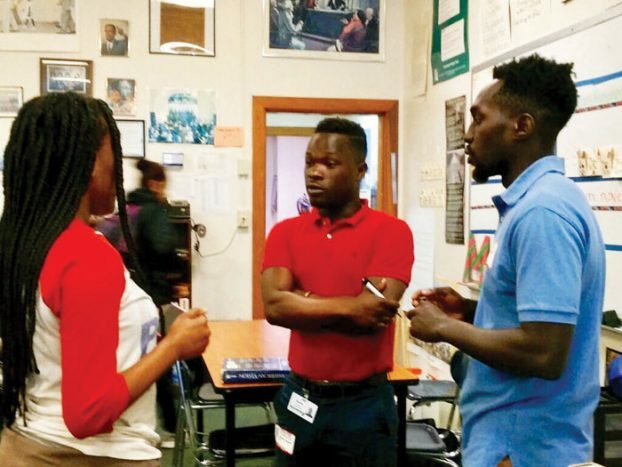 Hanson Saryee, a recent graduate of the University of North Carolina at Pembroke and recent addition to the staff of Rowan County’s Crosby Scholars, agreed. “We recognized how important our college education and experience was to each of us and wanted to find a way we could encourage more high school students to choose the path of higher education,” Saryee said. Joining Watkins and Saryee was Jamie Miller, a North Rowan graduate who earned a bachelor of science in sociology from UNC-Greensboro and is employed as a legal assistant at Huggins Law Firm in Greensboro. Also on the team was Robin Moulton, a Salisbury High alumni who will soon be on his way to a Peace Corps assignment in Uganda. “Jamie and I have have known each other since elementary school. I met Hanson and Robin during high school and got to know them better in college. Even though they are Salisbury Hornets, I do not hold it against them,” Watkins joked. The group named themselves the Achievement in Motion — A.I.M. — Team. The friends worked to pull together the Achievement in Motion Camp for rising sophomores in Rowan-Salisbury Schools. The camp will give students the chance to consider their future and the role education will play in it. Crosby Scholars is partnering with the A.I.M. team to promote the camp to students in Rowan County. The camp will be held at Rowan-Cabarrus Community College in conjunction with the college-access program. The team is working with community leaders for assistance with meals and transportation. “I believe that we have an amazing team, and I am grateful for the community leaders and organizations that have supported the initiative,” Watkins said. The Achievement in Motion Camp will be held from 9:30 a.m. to 1:30 p.m. June 20-22 at Rowan-Cabarrus Community College’s North Campus, Building 600. For more information, contact Hanson Saryee at 484-757-0870 or the Rowan County Crosby Scholars office at 704-762-3512. Current Crosby Scholars can sign up in their student portals. Spaces are available on a first-come, first-served basis.